Gift card holder or greeting card. 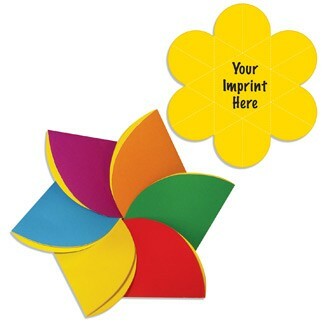 Our unique shaped card holder folds to create a 3D design pinwheel, flower or snow flake, with custom imprint on front and back.This sleeve will hold standard size gift cards. Perfect for restaurants, hotels, malls, thank you client gifts or any retail establishment. Note :Price includes one color, one side. Image shown may be more than one color, see additional color charge for pricing. Ships flat, minimal assembly required.